The best way to connect PowerPro to monofilament of similar diameter. 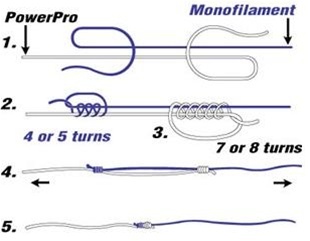 1) Pass the PowerPro and monofilament at least 12 to 18" past each other so that loops can be formed. For a stronger knot, double the PowerPro. 2-3) Starting with the PowerPro, make 6 to 8 wraps through the loop and pull to tighten. Do the same with the mono except 4 or 5 wraps are enough. Pull on the tag end. Look to see that the wraps don't cross over each other. 4-5) Pull on the standing lines to jam the knots together. Trim.